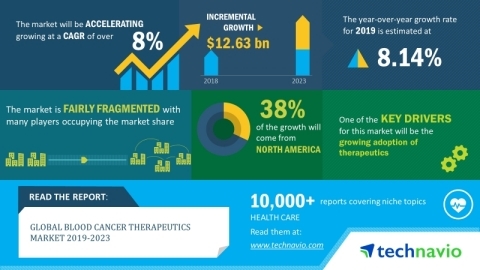 Technavio has announced the release of their research report on the Global Blood Cancer Therapeutics Market for the forecast period 2019-2023. This blood cancer therapeutics market analysis report segments the market by type (leukemia, lymphoma, and myeloma) and geography (Asia, Europe, North America, and ROW). Global blood cancer therapeutics market size will grow by USD 12.63 billion during 2019-2023, at a CAGR of over 8%. There is an increase in advances in the research of regenerative therapies due to their curative nature. Multiple targeted therapies such as CAR T-cell therapies have been approved and are gaining traction as they effectively treat leukemia and lymphoma. These therapies are also in the final stages of clinical trials for other cancer indications. The presence of vendors with novel therapies in the early stages of clinical trials for CAR T-cell therapies and gene therapies for blood cancer is also increasing. This is resulting in the development of sufficient therapeutics for blood cancer, which will lead to market growth. Various organizations are focusing on creating awareness about the existence of novel therapies with the potential to cure the disease. They are also making efforts to create awareness about the disease in major countries of Europe. With the global increase in the prevalence of cancer, there is an increase in the number of patients undergoing diagnosis and opting for treatment for conditions such as myeloma. Vendors and government organizations are coming up with patient assistance programs to deliver the therapy at an affordable price. This is leading to increased patient adherence and adoption of therapeutics for the treatment. "The presence of various large pharmaceutical vendors with novel therapies in the late stages of clinical trials and a strong pipeline will drive the blood cancer therapeutics market growth in North America. Additionally, the high influx of patients being diagnosed and seeking treatment, encouraged by the increasing number of awareness programs conducted by vendors and various organizations will also drive the growth of the market in North America," says an analyst at Technavio. Numerous vendors and organizations are introducing programs to reduce the cost burden on patients by minimizing costs associated with therapeutics. Also, government organizations are ensuring the delivery of treatment at an affordable price by providing funding for the development of healthcare infrastructure. As a result, the healthcare infrastructure in nations such as China and India is advancing at a significant rate. This will attract more patients and boost the adoption of blood cancer therapeutics. Technavio is a leading global technology research and advisory company. Their research and analysis focuses on emerging market trends and provides actionable insights to help businesses identify market opportunities and develop effective strategies to optimize their market positions. Technavio's report library consists of more than 10,000 reports covering 800 technologies, spanning across 50 countries. Their client base consists of enterprises of all sizes, including more than 100 Fortune 500 companies. Please contact our media team at media@technavio.comformore information.